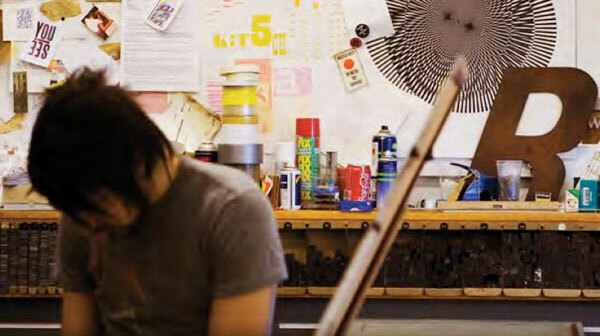 A 4 Year BA(Hons) course in Visual Communication allowing students to specialise in graphic design, illustration and photography or develop interdisciplinary skills in traditional and digital media. Staff are practising designers, illustrators, printmakers, photographers, and typographers working internationally. Our graduates often progress to employment with leading design groups including Browns, Graphic Thought Facility, Moving Brands, Lust, Made Thought, and Dreamworks. We place a lot of importance on the course being project led and studio based. Students have dedicated studio space, access to workshops and facilities across the GSA as well as high end graphic and photographic facilities within the department. Several of our graduates have been featured in Creative Review as ‘ones to watch’ including recently Sisi Lu, (September 2011 issue) who was also awarded a Gold Medal Award from the New York Festivals Television & Film Professional Awards while still an undergraduate. Graduates of the department have repeatedly won best of show awards at Design & Art Direction’s ‘New Blood’ exhibition in London ( 25% of the awards in 2006 and 20% of the awards in 2004 ). Design Week listed the School of Design at the GSA as “leaders in design education” and one of its HOT 50. The Glasgow School of Art is also a Partner by Design with Adobe ( a partnership with internationally recognised centres of design excellence), with several of the staff also participate as Adobe Education Leaders. This ensures students have access to the latest software and that staff are in dialogue with Adobe to shape future versions of design software. Graduates of the Department include John Hamilton (Art Director, Penguin UK), David McKendrick ( Art Director, Esquire ), Mike Montgomery (Senior Designer, Graphic Though Facility) and Sharon Colman (Dreamworks), Oscar nominated in 2006 for best animated short film. Telephone: +44 (0)141 353 4512. The Master of Design (M.Des) in Visual Communication is a two year programme delivered by the Department of Visual Communication at Glasgow School of Art. The programme is practice-led and process-oriented in relation to definitions of broad design practices. It is also committed to the acquisition of principles within design theory relating to educational and commercial contexts. The programme provides rigorous methods for the interrogation of visual and textual research, positing questions relating to the role of the designer in society, and fundamental questions regarding personal and social responsibility. Equip students with the highly developed intellectual, practical and interpersonal skills deemed necessary for careers in design. M.Des in Graphics / Ilustration / PhotographyThe M.Des in Graphics / Illustration / Photography is run alongside the two year M.Des in Communication Design. It is a one year, 180 credit masters programme, with three subject specific pathways. The M.Des in Graphics / Illustration / Photography is designed specifically for students wishing to explore, at postgraduate level, subject specialisms in one of these areas. Applications to the programme should make clear which pathway of study the student is interested in studying. The M.Des in Graphics / Illustration / Photography aims to furnish students with the research skills and methods for stimulating innovative design practices within a variety of social, economic and technological contexts and services. The programme is delivered via a series of taught workshops, tutorials, set and elective projects, lecture and seminar based sessions and self-directed learning. The emphasis of the programme rationale is on contemporary practices of Visual Communication, underpinned by theoretical research, and the social, technological and economic contexts of contemporary design practice. Students on the programme are expected to engage in a high level of self-directed learning, research and independent critical reflection as well as participating in taught elements. Elective (15 credits), chosen from the broad menu available at GSA. Applications for taught postgraduate programmes may be submitted at any time during the academic cycle. However, interviews are held, and places offered, from the beginning of the academic year (September); early application to ensure consideration for a place is therefore encouraged. An application for the M.Des in Communication Design should include the application form, personal statement, two references, proof of IELTS 6.0 (if appropriate), and a portfolio on CD of visual material. Paul Stickley, Programme Leader, Communication Design.